The hardships of life in the AfterFall wear on everyone a little differently. Some people get tougher, more bitter, out in the wastes. They let life weather them. Others just give up. Ramos Lyle has never fallen into either group. He chooses to face the trouble he finds with a smirk on his lips and a quirky joke. That’s not to say that thing are any easier for him than anyone else. In fact, his time in the Patriots taught him that he’s no more prepared to handle the harsh realities of life than anyone else, and his odd humor didn’t always go over well with his teammates. 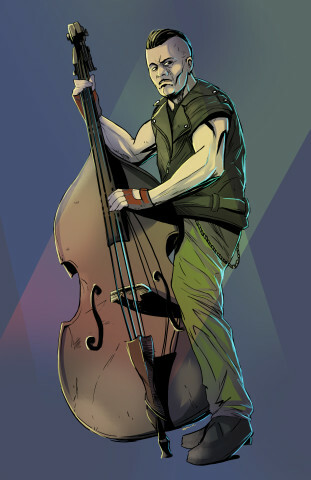 One fellow Patriot at least took a liking to him, taught him to play the bass, and eventually gave him a new home in the Harbingers. Now his off-beat humor blends well with his syncopated rhythms, and he has a better way to keep things from looking quite so grim, for himself and any who hear his music.